Fragrance, flowers and brilliant green leaves -- jasmine plants (Jasminum spp.) have it all. Most gardeners are familiar with evergreen twining vines like star jasmine (Jasminum nitidum) and white or pink jasmine (Jasminum polyanthum), but bush jasmine is also an excellent garden ornamental. Jasmine sambac, also known as Arabian jasmine, is one of the best bush jasmine choices, and has small snow-white flowers with an intoxicating fragrance. Despite its prima-donna beauty and rock-star pizazz, jasmine sambac is low maintenance when sited appropriately in the garden. Not every jasmine plant bears the classic fragrance, but most varieties do. The small flowers -- often white, but sometimes pink or yellow -- usually pack a punch in the scent department, and a small sprig can scent a room. The many species and styles of jasmine fall into two categories: vines and bushes. The most famous members of the jasmine family are vines, like white jasmine, and can be trained to climb a trellis, tree or fence. Jasmine plants have both beauty and vigor, and vining jasmines are no exception. They can become invasive and take over your garden left to their own devices. That's because they root wherever a stem piece touches the ground. Bush jasmines can be invasive too, although they are a little less vigorous than vine jasmine. Sold as shrubs, bush jasmines have a sprawling growth habit and require regular pruning to keep them from getting gangly. One of the top varieties of bush jasmine is jasmine sambac (Jasminum sambac). Like other bush jasmine species, jasmine sambac must be pruned often to shape it. But in many ways, its care requirements are the same as for vine jasmine. Like other jasmines, sambac is a broad-leaf evergreen that likes a site with full or partial sun. The more sun, the more flowers. If you ever have the pleasure of wearing a Hawaiian lei, the flowers will be from the jasmine sambac, called pikake on those islands. Like other jasmines, jasmine sambac grows readily in any moist, well-draining soil and requires adequate water during the summer growing season. Its water needs decline in winter. The plant thrives in U.S. Department of Agriculture plant hardiness zones 9 through 11. It can survive a winter in zone 8, but everything but the roots will freeze and need to regrow in the summer. If you try this route, don't expect flowers until August or later, since the plant must regrow itself. Note that jasmine sambac is considered a Category II exotic invasive in Florida. Here's another curious way that bush jasmine mirrors vine jasmine: if you grow it up a trellis, it turns into a woody vine that can shoot up some 25 feet. If you are hoping to keep jasmine sambac a shrub, prune, prune prune. Ideally, you want the shrub to be about 5 feet tall and 4 feet wide. You'll need to prune your plant early and often. The serious pruning should wait until after the jasmine's main bloom cycle. But you can lightly trim your shrub jasmine back all year long. One way to do this is by extended deadheading when flowers fade, trimming the shoots back to just above a lateral bud. 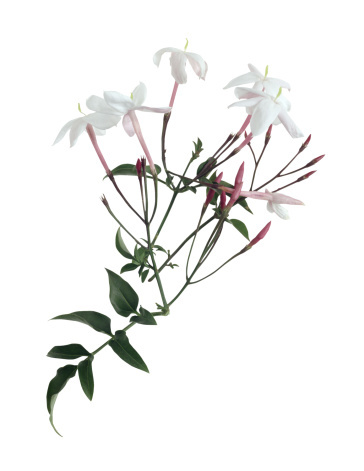 Your jasmine sambac will usually not be plagued by pest or disease problems. It might attract spider mites or aphids, but these can almost always be controlled without using chemicals. Spider mites are about the size of grains of salt. Early symptoms of spider mites are yellowing and "dirty" leaves, as well as spidery webbing around buds and leaves. Aphids cause twisted plant growth. These soft-bodied insects can also cause the leaves to turn yellow and sticky. Look for them clustering on the tip of the plants and the undersides of leaves. A strong blast from the garden hose can be enough to dislodge these pests. If not, use organic products from your garden store, like insecticidal soap or horticultural oils.